I have for you today a card with no sponging. If you can believe it I didn't even reach for a sponge, not even once. While I was making this card I was humming one of my most favorite songs: Blue Skies Shining On Me, there are many versions of this song, but Ethel Merman's version is probably my favorite, she could really belt out a tune. I recently found The Three Muses Challenge blog and really like their style. I want to wish them a Happy 2nd Birthday and send blue skies for continued success. They have provided us with a wonderful place to play. I have to give you a link to Catherine Pooler, she has some really great YouTube videos, with all kinds of projects. That's where I got my instructions for these really cute pinwheels. The big one starts out as a 3" X 3" square of double sided paper. In the video she says she doesn't think a 2" X 2" square would work, but I needed a smaller pinwheel to balance out my scene, so guess what it worked. Thank you Catherine. Hope Blue Skies Are Shining on you this weekend. Supplies: 5" X 6 1/2" Marina Mist Card Blank, Papers: SU-Marina Mist, Green Galore, white computer paper, K&Co-KP Valentine Paper Pad, Stamps: SU-So Happy For You, Ink: Ranger Archival Ink-Jet Black, heart brads-Creative Impressions, MFT Die-namics-clouds, grass, coffee stirer, Scor-Tape. Oooh I loved Ethel Merman, what a voice and such a great character actress, brilliant. That is adorable--what a great card! So cute! Perfect for spring/summer birthdays. Oh man, now I have that song in my head! This is such a sweet card. 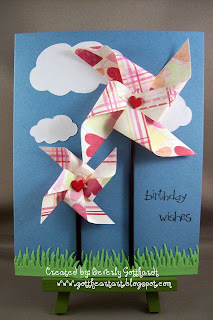 I love the heart brads paired with the heart paper pinwheels. Too perfect. Thanks so much for playing along with us at OPUS GLUEI. This card is marvelous, love your interpretation and that you were singing along - if THAT doesn't sound contented and happy - nothing does. Your matchbox is on its way and I apologize for its lateness!